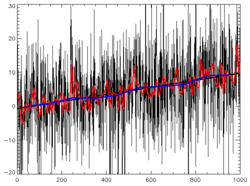 Time Series Modeling and Forecasting are usually based on the assumption that the series is stationary. Hence any series violating the above will have to be made stationary through the use of Mathematical transformations. There are many ways to know if a series is stationary, but the easiest remain the visual observation through the sequence plot. To know a stationery series from observing the plot, the following should be noted. 1. The mean has to be constant. Hence, any series with a trend (either Upward or Downward) is not stationary, because the Mean increases or decreases with time. 2. Homoscedasticity : Variance in the series should not be a function of time and through inspection of the series this could be easily identified. 3. Constant Co-variance : the co-variance structure also has to be constant overtime and any notable shift in the Co-variance structure at a point in time will indicate the series isn't stationary. The new series will have one less point than the original series and if the series still has an indication of trend then Second order differencing could be employed but one usually does the work. A trend model could be fitted on the series, then the residual modeled, which is usually a straight line to simply remove long term trend. A series with a varying variance could be made stationary with the help of Log transformations or Square root transformations to stabilize the series. Seasonal Variations could also be a cause of variaition in the series but we won't be dealing with elimination of seasonal trend here, check in the main Time series lecture page for full information on elimination of seasonal trend.